Abhorrent working conditions with little to no regulation pushed many workers to the brink of uprising. H. Heine’s poem “The Silesian Weavers,” about a protest by workers of the same name, claimed the weavers were producing Germany’s funeral shroud as they “[sat] at the spinning wheel, snarling cheerless.”3 The Weavers’ protest pushed the King of Prussia to give his people a constitution. To many, such an uprising would be seen as a success, but the economist Karl Marx would consider it an incomplete revolution because the workers remained in their debased position in the aftermath. Marx viewed increased regulation and improved working conditions as nothing more than appeasement which made workers complacent slaves to the capitalist system. The enlightened idea of progress was dominant in many thinkers’ rationales, but what progress looked like often differed. In regard to Marx’s view of progress and the necessary worker revolution, do regulatory policies such as shortened work days and minimum wage significantly improve workers’ lives, or simply keep them in a perpetual state of oppression? 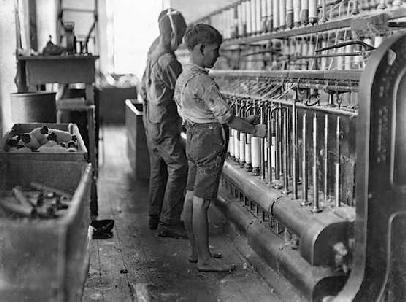 This entry was posted in HIST107-Archive and tagged Child Labor, industrialization, Karl Marx, Richard Oastler, Silesian Weavers by alil. Bookmark the permalink. I disagree with Marx’s belief that regulation and improved working conditions were forms of appeasement during the Industrial Revolution. These societal improvements guaranteed civil rights for Europe’s population. Such regulations made it so modernization could continue, but in a much safer way. Rather than shutting down these capitalistic processes, which could have slowed Europe’s progress, these regulations permitted society to continue to innovate.